Brain aneurysms aren’t easily diagnosed. There’s no definitive cause for their formation, nor are the symptoms easily recognizable in their earliest stages. For some, it’s not until an aneurysm ruptures that it’s existence is even known. Then there are others who, for one reason or another, are alerted to an aneurysm’s existence through tests for other ailments. For example, Loren Ridinger’s aneurysm was first detected because doctors were seeking answers to other medical problems. Still others suffer injuries requiring tests that can become life-saving. Take the case of Kaipo Pomaikai. Doctors said that Pomaikai had the aneurysm for years, and probably would have died within the next couple of years if he had not gone to the hospital that day. Pomaikai admits that, without the volleyball incident, he would have never sought treatment since he showed no symptoms before that day. Now, with surgery successfully completed, he has a second lease on life. 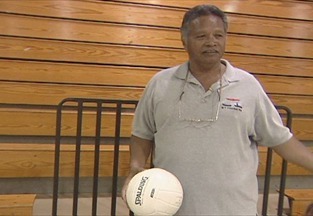 With that second chance, Pomaikai is trying to find the young volleyball player who took that fateful shot — and thank him for saving his life.